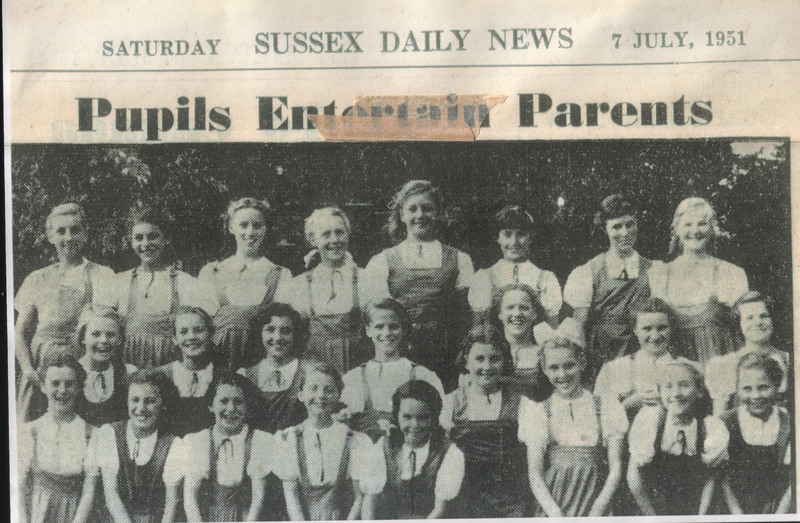 This cutting is from the Sussex Daily News, published in July 1951. My mother Eunice is in the middle row,second from the right. Hope this brings back happy memories for many. Do you recognise yourself or anyone else in this photograph? If you do, please leave a comment below. this photo brings back memories. I think it was to do with the Regency Brighton Celebrations 1951. We performed country dancing at the Corn Exchange and the Pavillion with many other schools from Brighton, but I think this photo was taken in the school playing fields at Moulsecoomb. I remember quite a few names:- Back row.L to R. Evelyn Lyons,Jeanette Brown, Zena Barnes, Beryl Rockall, — Virginia Moody,Val Fuszard, Joyce Hamilton. Middle row:, — Pauline Potter, Eunice Pickett. Front row:- Barbara Nippard, Maureen Parrot,Barbara Ward, Olive-, Brenda Imms, Josephine Tume, ——– It was good to see it again. The girls in bibs danced as boys, and the girls in dirndle skirts were the girls. The blouses were white with a green ribbon at the neck and the skirts were bright pea green. They were only used for shows and competitions. Most enjoyable for all concerned. I hope that this jogs a few memories. Valerie. Hello Valerie Woodward. I haven’t been back to this site for a couple of years. Did you ever manage to get hold of my Auntie Jeannette? Hi Glenn, I also haven’t been back to this page for some time. I did hope that Jeanette might get back to me but sadly I didn’t manage to make contact. Thanks for trying anyway. Love to catch up with Josephine Tume, if possible.